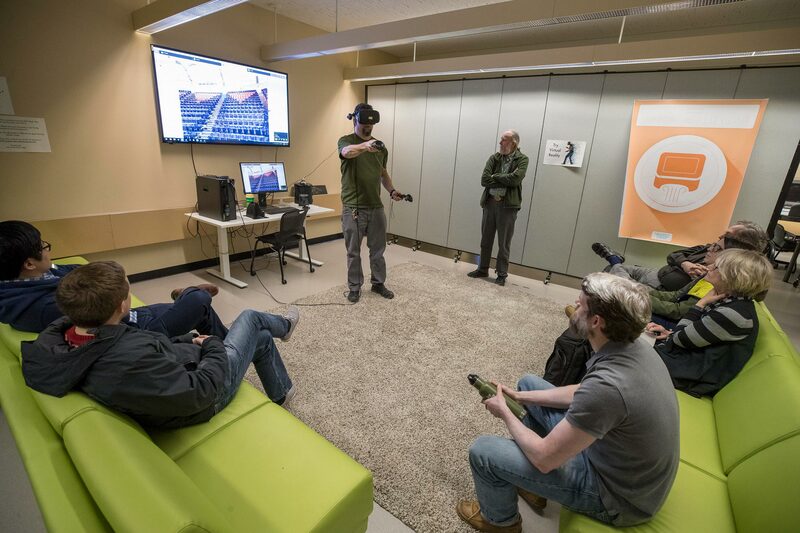 In a virtual reality lab in the University of Virginia’s Clemons Library, with the aid of a headset and two hand controls, spectators walked through University Hall, the University’s now-closed athletic arena. They could glide across the hardwood floor, then leap from there to the press box, to the scoreboard and to center court, flying through virtual space. 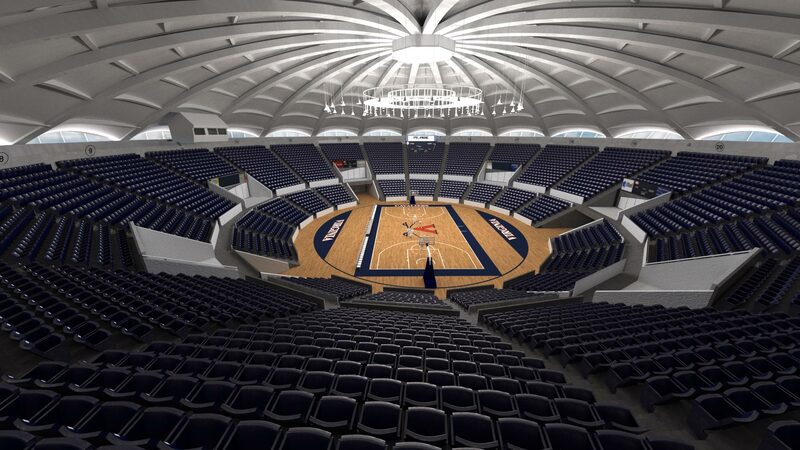 They bounded from the court to the highest tiers of orange-and-blue seats, and even took a virtual stroll on the scalloped, cast-concrete roof. It is in this virtual world that the iconic old building will survive, even after it is gone from the real one. “U-Hall,” as it is commonly known, served for nearly five decades as the University’s sports arena and hosted many cultural events before closing to public use in 2015. With its role supplanted by John Paul Jones Arena, it is now slated for demolition in early summer. But before that happens, several UVA students, faculty and staff members are documenting the building with 3-D data-acquisition methods and still cameras. Once the data acquisition is complete, additional processing will create models that can be used for a variety of purposes, including virtual reality tours and 3-D reproductions. “Once we’re done, you would be able to go over the data and rebuild it down to the millimeter,” said Will Rourk, a 3-D data and content specialist with the UVA Library’s Scholars’ Lab, who is collaborating on the digital preservation project with UVA’s Institute for Advanced Technology in the Humanities. 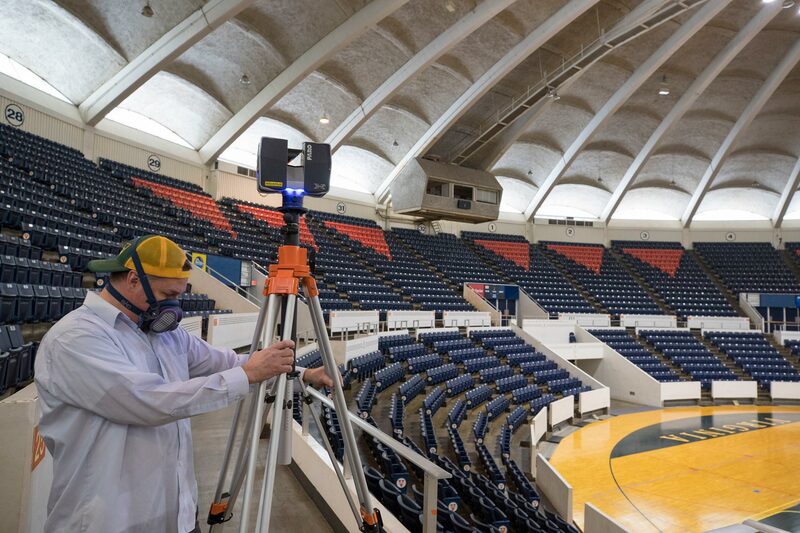 Rourk used lasers to scan the interior of University Hall, collecting surface data and measuring the space, using two scanners on tripods simultaneously reading different parts of the interior of the arena. Once he completed the arena, he scanned one of the locker rooms and the area that served as the “green room” for performance artists and bands. At the same time Rourk was scanning the arena, assistant professor Nicola Bezzo, from the Department of Engineering Systems and Environment, and graduate students Rahul Peddi, Esen Yel, Paul Bonczek, Shijie Gao and Ishika Paul were using an autonomous robot mounted with laser scanners to collect complementary information on the building. Bezzo, who previously used his robot to produce a laser-scan map of the Crozet Railroad Tunnel, is collecting data on the building with an eye toward recapturing some of the experience of the building. As in the Crozet Tunnel, Bezzo is using Light Detection and Ranging, or LiDAR, technologies, for his mapping. Apart from mapping the building, Bezzo is working on perfecting autonomous robotic self-localization, which is how a robot determines where it is in a given space. Building precise maps online as a robot explores an environment is one of the most important tasks in robotics, enabling autonomous navigation, especially in unknown environments. Meanwhile, Shayne Brandon, the systems administrator and 3-D data acquisition specialist at the Institute for Advanced Technology in the Humanities, was also documenting the building, recording it with photogrammetry, which records objects in single-image frames that are then processed with computer software to produce a 3-D point cloud or model. Brandon recorded the outside of U-Hall with a quadcopter, a four-rotor, radio-controlled drone carrying a camera. He also photographed the inside of the building with a Nikon D850 hand-held camera. Shortly before Christmas, he took thousands of photos of the ceiling of the arena. “I am trying to capture the ceiling, the ribs of the dome and the shape of the ceiling and the floor,” he said. Brandon had already taken 4,000 photos of the exterior of University Hall using the drone and another 17,000 inside. 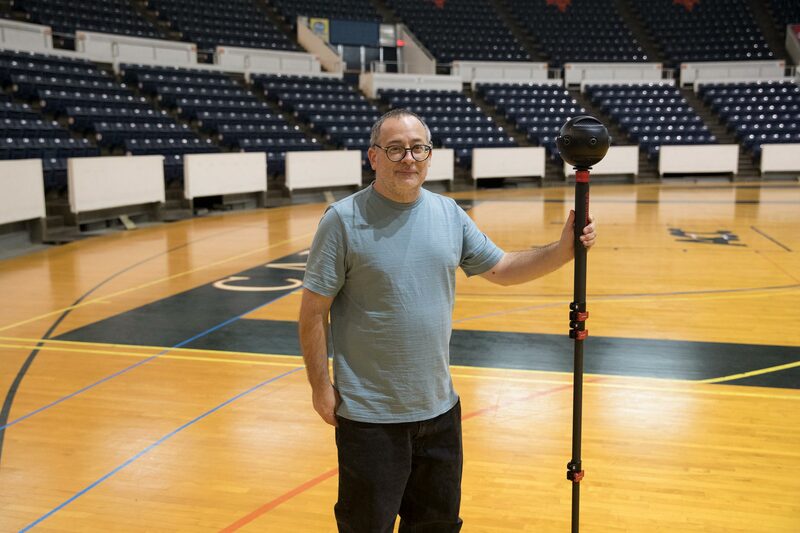 He used a 360-degree camera to record more than 150 spherical panoramas throughout the building and arena. To create a 3-D model from the images, Brandon uses software running on the Rivanna High Performance Computer Cluster, which determines the surface geometry of U-Hall from the set of photographs, and along the way computes the camera lines and the vantage point from which each was taken. Brandon said the photogrammetry data can be combined with Rourk’s team’s laser scans to create more complete models that can have a variety of uses. Worthy Martin, acting director of the Institute for Advanced Technology in the Humanities and a member of the computer science faculty in the School of Engineering, said the 3-D data-acquisition methods such as laser scans and photogrammetry record a series of points along a surface and then reproduce the shape in a point cloud, similar to a pointillist painting. Martin said while the interior could be scanned with a laser, the exterior roof could not, since the lasers are ground-based and not able to “see” the curved roof. He said the drone images will be used to reproduce the roof. The data from Brandon’s photogrammetry will be processed together with Rourk’s laser scan data to produce a combined dataset. Second-year architecture students Dylan Gibbs and Luke Schiavone have also created computer models of the building using the original blueprints and some photos of the building as it exists. Architecture professor Earl Mark is directing them as part of a class exercise. Gibbs, who works as a graphic design student worker for the football team, concentrated on the inside of the building, while Schiavone focused on the exterior. Rourk, schooled in architecture and architectural history, spent a day scanning the arena space, from the curved ceiling to the hardwood basketball court, and then several days working the other parts of the building, such as the corridors and concession stands and the empty weight room. After he finished scanning the arena, Rourk plotted out the shots in the lower concession area, mentally measuring angles and lines of sight – moving one round table and a set of chairs so it would not block the line of sight to a support pillar he wanted in his scan. As the scanners worked, a few students and athletic personnel, as well as some workers from Facilities Management, trickled in and out of the building. Minor detritus – a single red-and-white sock, an orange field hockey ball that came to rest against the base of a wall and a small abandoned barbell outside the back door – mark the building now. A building that once saw its arena and corridors jammed with fans rang hollowly as a single set of heeled boots click-clacked down the curving corridor. Several weeks after scanning the structure, Rourk presented the fruits of his scans in the virtual reality lab at Clemons Library. Meanwhile, Brandon has begun populating a website that will enable anyone in the world to virtually explore University Hall. A performance by the Czech Philharmonic Orchestra was the first event held in the building, on Nov. 13, 1965, followed a week later by a concert by the Supremes and the Lovin’ Spoonful. The first basketball game in the arena was held Dec. 4, 1965. For the next several decades, the arena hosted theater performances, speakers, and classic and popular music from the London Symphony Orchestra and Boston Symphony. Among the artists who performed at U-Hall were Louis Armstrong; Peter, Paul and Mary; the Grateful Dead; Kool & the Gang; REM; the Beach Boys; the Ramones; and Elvis Costello, as well as stage productions of “La Boheme,” “Fiddler on the Roof” and “Carmen.” U-Hall also hosted graduations and convocations. In 1989, President George H.W. Bush held a national education summit in University Hall with the governors of all 50 states. Fewer than half the events in University Hall were athletic, but the University had great success in basketball there as well. Architecture student Dylan Gibbs used the original blueprints and some photos of the building as it exists to create a computer model of the arena in University Hall. The Cavaliers saw their first 20-win men’s basketball season in 44 years in 1971-72, entering the Associated Press’ Top 20 ranking for the first time. From 1979 to 1989, the men’s team had a 225-101 record, including 12 weeks at the top of the national polls, three Atlantic Coast Conference Championships, two appearances in the NCAA Final Four (in 1981 and 1984) and two in the Elite Eight, and a National Invitational Tournament championship in 1980. In the early 1980s, the team had a 50-2 record under three-time national player of the year Ralph Sampson. Women’s basketball also flourished in University Hall, with the team reaching the Final Four three years running, from 1990 to 1992. A women’s game on Feb. 5, 1986 drew the largest basketball crowd in University Hall’s history: 11,174 people. The more-than-capacity crowd, lured by a promise of free hot dogs and a matchup against archrival North Carolina, prompted the fire marshal to later limit attendance at any event to 8,900 people. The women’s program produced several national basketball stars, including Dawn Staley, who played for UVA from 1988 to 1992, played on the gold medal Olympic basketball teams in 1996, 2000 and 2004, and was on the 2001 Women’s National Basketball Association championship team. Her Cavalier teammates, twins Heidi and Heather Burge, played for overseas professional teams before joining the WNBA in the late 1990s. Former player Val Ackerman, who graduated from UVA in 1981, became the first president of the WNBA and the first female president of USA Basketball. The last basketball games to be played in U-Hall came in 2006, before the teams moved across Massie Road to John Paul Jones Arena. While U-Hall continued to be used, the arena itself was permanently closed in 2015 when a leaking roof caused problems.